au courant shops, galleries, hotels, bed & breakfasts, and restaurants featuring award-winning, inspired cuisine. The island's 82 miles of picture-perfect, freely-accessible, and highly-acclaimed beaches alone are worth a visit! 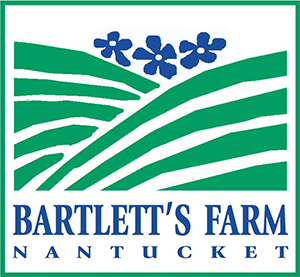 Nearly half of Nantucket's 30,000 acres are preserved under the protective stewardship of the Land Bank and Conservation Foundation. Within these pastoral tracts, 100 botanical and 300 bird species--many of them rare--luxuriate. 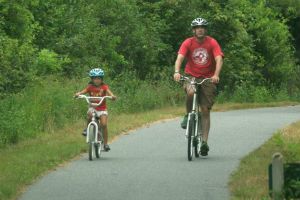 A 32-mile network of gently-meandering bicycle paths invites exhilarating exploration of town and its hinterlands. Well-preserved historical sites, as well as downtown's Cultural District comprised of museums, theaters, and galleries ensure visitors can immerse themselves in Nantucket's diverse treasures. Alternate the in-Town experience with dreamy days relaxing on land or sea — or "hanging ten" on southern beaches popular with surfers! 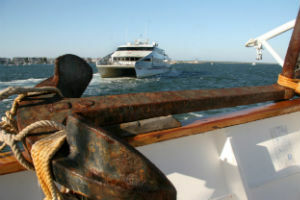 Nantucket is one of America's most prestigious ports of call; in season, the variety and opulence of vessels moored in Nantucket Harbor is impressive. Sophisticated palates will find extraordinary dining in sumptuous, simple or al fresco settings. 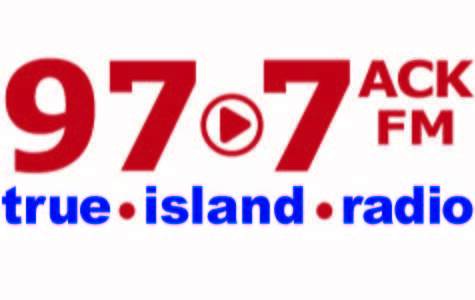 Island cuisine has as its hallmark local seafood, which is fresh, plentiful and delicious. A bevy of pastimes, so much natural splendor and endless recreational pursuits make the Faraway Island a peerless destination. Below are travel resources on how to get to Nantucket. There is no bridge! And, it's not necessary to bring a car, as convenient public transportation services allow easy access to all parts of the island. 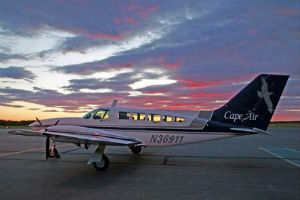 Despite its remote location 30 miles at sea, Nantucket has the second-busiest commercial airport in Massachusetts and is easily accessible by major and local airlines and aircraft charters. Convenient flights are available year-round from airports in Boston, Hyannis, Martha’s Vineyard and Westchester/White Plains. Jet Blue, Delta, American and United Airlines operate seasonally from JFK, LaGuardia, Newark and Washington, DC, and Charlotte-Douglas International Airport. Getting to Nantucket from New York City and Boston is a breeze, thanks to commuter bus and train service to the Hyannis Transportation Center, two blocks from the harbor. Plymouth & Brockton Bus Line provides convenient service from Boston’s South Station and Logan Airport. Peter Pan/Bonanza Bus Lines departs from New York (Port Authority), with an approximate 6 hour travel time. 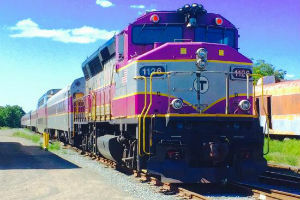 A seasonal train, the CapeFLYER, operated by Cape Cod Regional Transit Authority, offers convenient weekend passenger service from Boston to Hyannis. 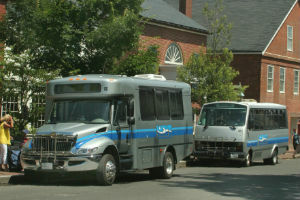 Nantucket Regional Transit Authority operates “The Wave,” a year-round shuttle bus servicing multiple routes throughout the island, including transit to Jetties and Surfside Beaches, and a Fast Ferry Connector from Fairgrounds Road and the airport. Shuttles depart from Nantucket Town and travel to mid-island and outlying areas, looping back to Town. All buses are handicap-accessible and accommodate two bikes on a first-come, first-served basis. Passes may be purchased aboard all buses or at the Greenhound Building on Washington Street. 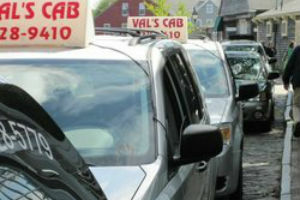 Both taxi and car rental services are available on island year-round, with convenient locations in Town and at the Airport. Nantucket is small and extremely walkable, so please consider leaving your car in Hyannis, where both ferry lines operate secure lots. Parking can be difficult on island, particularly in high season, and it is rather expensive to ferry your car back and forth.